I just found found an article about A Gentleman’s Dignity, unfortunately the article all in Japanese. So I don’t know what they write about the drama or Collin, but I snapped Collin photos that makes me miss him badly. CNBLUE‘s Jungshin and AOA‘s Seolhyun were spotted filming KBS 2TV‘s ’My Daughter Soyoung‘ on the streets of Hongdae recently. Jungshin appears as the chic and picky ‘Kang Sung Jae’ in the drama alongside FNC Entertainment labelmate Seolhyun, who plays his girlfriend ‘Eun Soo’. On November 6, onlookers crowded the Hongdae area to watch the on-screen idol couple film a scene in which Kang Sung Jae passes out feminine care products on the street when Eun Soo comes across him. Sung Jae (played by CNBlue’s Lee Jung Shin) is given a challenge to give out people tampons and pads in the street. In the episode of KBS2’s Saturday-Sunday series My Daughter Seo Yeong that aired on November 17, Sung Jae gives out passers-by tampons and pas in order to overcome his shyness character for his acting career. Singing up a contract with an agency, Sung Jae gets an acting lesson. While reading a script, he feels shy and mutters, and his tutor gets mad. Evoked by her harsh comment, Sung Jae finally heads out with a basket of tampons and pads. Hesitating for a long while, he carries out the mission, finding himself less nervous about the situation and strangers. ‘My Daughter Soyoung’ airs on Saturdays and Sundays at 7:55PM KST. Here CNBLUE’s 5th member! Hello guys it’s me Yonghwa. Whose face do you see? Kkk, For me I see my self kk. Today we are practice for concert!!! 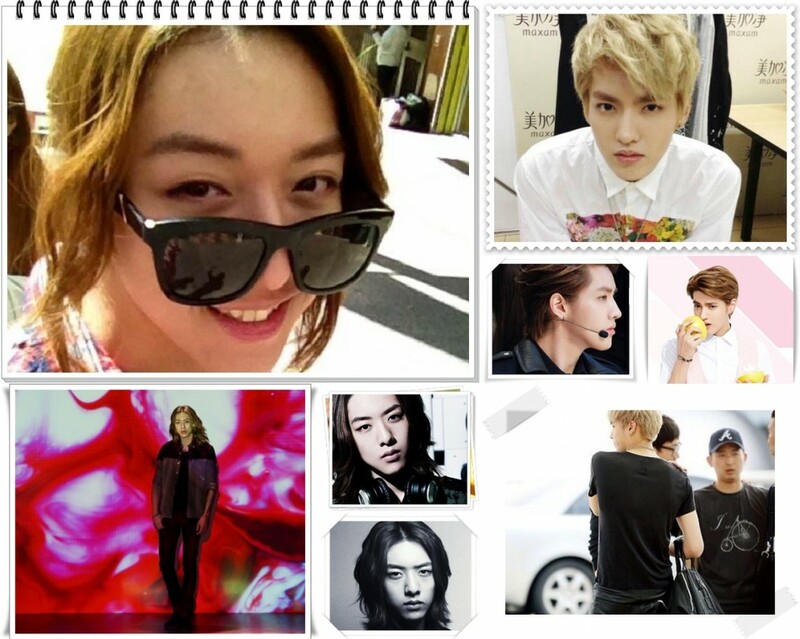 It is looks that Yonghwa put four pictures of the rest CNBLUE members and edited to become one person. Apparently he tried to get to know what twitter can do or editing himself picture. I wonder who had taking the picture. I made this post as b’day present to my self actually, having struggle with my book publishing and fail with my deadline I came into my laptop and found this articles and for CNBLUE’s 1000 days debut anniversary. It seems that I’m too bias to Jonghyun, for I have never think who my bias is as I always follow them as CNBLUE. I fell into this story right after I read the part 1 and curious what next Jonghyun will write. When it finally published into 3 part I always wonder whether I can read this without jump to the another pages. This story, aside telling what Jonghyun had ever felt about his first ever drama, also telling within CNBLUE it selves. I never tired to read to their story as many things I can learn from them. in fact it was them too who lead me into this far. For all I have achieved in the recent 3 years and for I fail too. Here the complete story based from Jonghyun had written himself . WHAT ‘s COLLIN UP TO? 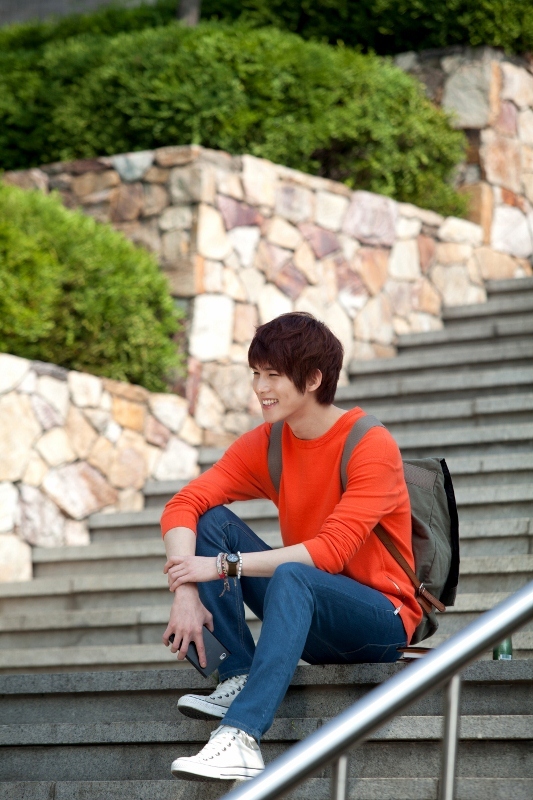 CNBLUE’s Lee Jong Hyun’s career can be divided into before and after “A Gentleman’s Dignity,” which recently wrapped on SBS. 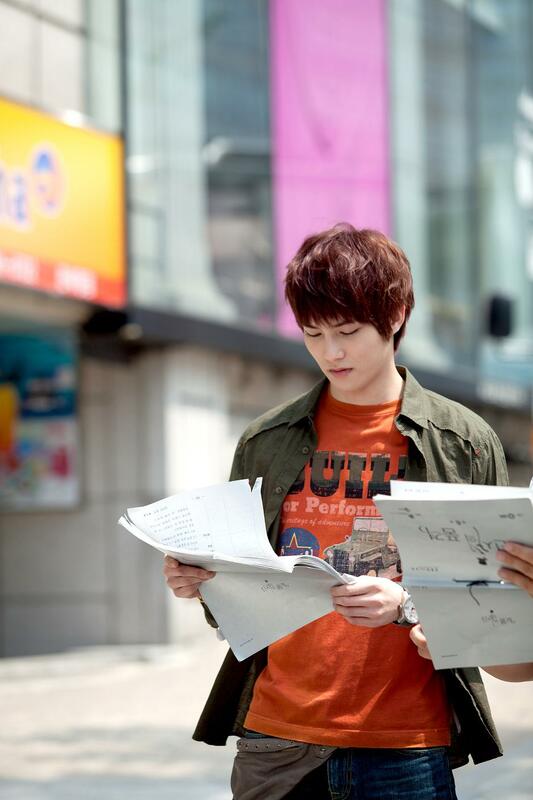 Lee Jong Hyun played Jang Dong Gun’s son Colin, and that’s how people began to know him. He had been known to their teenage fans but hadn’t really had a chance to appeal to the elder audiences before. The following writing is a recounting in Lee Jong Hyun’s own words. It’s almost been a month since I parted ways with Colin. The disappointment that was left at departing is now changing into a strange longing but I haven’t been able to let him go just yet. He’ll probably be in a corner of my conscience for the rest of my life. The anxiety that took me when I first met him is now become a very precious memory. Colin, who gave me great memories, opportunities for future challenges and many other things, is my unforgettable friend. I was a member of the band that had no interest in acting and especially within CNBLUE. Even when Jung Yong Hwa and Kang Min Hyuk had started, I never think about it. Is it because I have an accent? No, I never fixed myaccent because I never wanted to act. I had a strange stubbornness for the phrase, ‘Once a singer, is always a singer.’ Even when my company suggested acting, I said, “I only want to sing.” I only wanted to show people the Lee Jong Hyun in the songs and on the stage. But Colin was the one who won over me. An amazing dude! I only went back on my word because Colin was a very attractive character. My management CEO left a script of “A Gentleman’s Dignity,” I found it so fun that I couldn’t wait to see what the next story would be. However, stubborn me couldn’t just say, “I want to do this.” I instead took on the role as if I couldn’t refuse them any longer, even though I really wanted to do it. If I had kept on being stubborn, I might have really regretted my decision. The stuff came quite difficult right after I said, “I do.” What was I going to do with my Busan accent? I even thought of perhaps giving up but Jung Yong Hwa said I’d regret it for entire of my life , so I took that to heart. Regretting things later is absolutely useless. I made up my mind to do it and auditioned for the role. It wasn’t easy as there were a lot of competitors and the camera test wasn’t simple. However, the crew, who were looking for a more westernized image for the character, liked me. Happiness aside, this was the real deal. I had to fix my accent and I had to practice. However, when the time came, there was nothing I couldn’t do and it was the first time that I thought people can really do anything they put their mind to. 6 months is long if you make it long and short if you make it short. I was able to conquer my accent and though it may be slightly awkward for those raised in Seoul, it was a huge improvement for someone like me. Minus the accent, I prepared myself to become Colin. I put in my best to figure out how I would be able to make Colin the best that he could be. Then there was the problem of acting. I had never received training when I had just getting rid of my accent. Jong Hyun! What have you done?? Up to the very first day of shooting, I focused on to Colin. I never let my script out of my sight and as the day approached, everything was putting pressure on me. I worried if I would be a burden for the production, which I didn’t want at all. Thanks to that, I lost 6-7kg of weight and my skin became worse as I began to have lack of sleep and rest. I wanted to appear on TV at my best condition but alas, it could not be so. As the anxiety began to fade away, D-Day finally came around. April 12TH was the very first day of “A Gentleman’s Dignity” filming and I was eagerly anticipating it. It was at a club in Itaewon and it was my first time meeting Kim Haneul sunbaenim. I couldn’t help my trembling heart as I saw her right in front of my eyes, reporting at the filming set since I was very impressed with her acting in the movie, ‘My Tutor Friend’. I was holding on my heart and saying that I was already prepared. Everything was in a different environment, an unfamiliar ‘stage’, but thanks to the staff and sunbaenims, we were able to safely finish the first shoot. It seemed like I looked very awkward on TV when I act, but I calmed myself down saying “slowly it will get better soon”. It was a day when everything was new, and it’s also the first time I ‘met’ Collin. 1. This Is An Honor Again? Rushed to shoot in earnest, I had to face one sunbaenim after another. Jang Donggun, Kim Haneul, Kim Sooroo, Lee Jonghyuk, Park Joo Mi sunbaenims and so on. For I only heard their names before, I could not help but letting out “Wow~” as I was awed being able to act together with these sunbaenims, it was surreal to me. Filming other than what was in the script and what we had practiced was almost impossible to me. From time to time, during the break the new script was revealed. I even had to practice acting with company’s manager! Then it changed from manager to Jang Donggun sunbaenims, then sometimes it was Meahri who became my partner. As usual in my head, it was all about Collin. The details of each scene were made easy by the sunbaenims and they offered to teach me during filming, since there were many unfamiliar and difficult scene. The sunbaenims’ advices were like a “treasure” to me. Especially the gang of 4 gentlemen, these sunbaenims gave me tips on how to gaze, to control my tone of voice and many more. They will be laughing at me when I was being awkward. My first acting experience had given me such great strength, thanks to their help. When the drama was going towards in the middle episodes, it was the time for me to act thoroughly. Facial expression, bitter-ish act, longing glaze were basically what I had to do. When I was worried about “how can I express what’s in Collin’s heart”, Jang Donggun sunbaenim gave me a big help. As I was still struggling with my character, the director’s described it to me and even though I understood it , my heart was not at ease. It was Jang Donggun sunbaenim who would always reach out his hand for me first. Sunbaenim’s character outside the drama is much cooler than what we see in the drama. It’s really sweet because he gave me the feeling that he being my real father. One day Jang Donggun sunbaenim told me, “It would be nice if my son Junhyeok is a big as you are right now”, and I was flattered. In fact, sunbaenim even asked me to call him ‘hyung’ instead of ‘sunbaenim’. He gave me such a comfortable feeling and great joy and I was so fortunate for that. Kim Sooroo sunbaenim knows how to spread the happy virus to everyone and made us laugh. Thanks to sunbaenim that had made the atmosphere within the filming set always sparkling. Next is, Kim Minjong sunbaenim. Can he described as the warmth crystals? He was the most famous among the staff and actors and always being nice. He’s 120% the same like his drama character Choi Yoon!! He’s an attractive man, one that you can’t look away if you happened to be next to him. Lee Jonghyuk sunbaenim is known for his meticulous acting. He gave me a very big help during the filming and I was always grateful for that. Not only the four senior actors but I was also thankful to each of the drama crew. When I see all those great people I worked with, I couldn’t help but to vow that “I’ll be as great like them too”. And not forgetting, Meahri!! To be honest, before the shoot I was wondering if I should prepare in case there’s a “love-line” for me (with Meahri) in this drama but since I’m Choiyoon-Meahri couple supporter too, so I pass! Besides, Yoon Ji Yin who’s playing Meahri is the same age as me. So, we had the cuteness of the scene that we had together. Haha. And since this was the first drama for both of us, we supported each other. I remind myself that “I’m able to be with such wonderful and great actors”,and for that I keep on being thankful. The first shooting began and about one month after the broadcast start! “Ah~ now a lot of people will see my face..” just thinking about that made me shake. The first “A Gentleman’s Dignity” episode was aired on May 26 at 9.55 pm. Even though I did not appear in the first episode, my heart was at ease. Haha. It was really fun for me because I wonder what the viewers were expecting for the next episode. And once again, I feel honored to be in such a good drama. In addition, we received the overwhelming response from the viewers since the first episode and so my respect for the seniors grew. Now that the show is airing, my heart is going ‘dugeun degeun’. Half excited, half scared, I have found ‘another me’ in Collin. I started to appear regularly in the drama starting from episode 3. Actually, CNBLUE members discuss with each other about the drama and they give comments. Even if it made me slightly hurt, I was thankful. We’re close, so they pointed things out honestly. Truthfully, that makes me work harder. I would be even more nervous if they only said good things. Haha. But of course there’s pain too. Ah~ rather than saying it’s painful, I take those as advice. Criticism from viewers who had watched the drama. Of course, it’s logical that I get such comments, so it has become a great help to me. Thank you to everyone. For all the advices and criticism, I am thankful. From the advices given, I was able to see myself from a different angle and able to understand my feelings better. Although it’s difficult, I know that there are things that I regret. Instead, I’ll keep up with my work and I’ll do my best to deliver a good appearance someday, so just wait a little bit for it. Because there is no other way, I will work hard. Especially as I am stuck in between Dojin (played by Jang Donggun) and Yisoo (played by Kim Haneul), as their ‘love intruder’. No wonder they hate me. Hahaha. One thought after another came to me as we shoot the drama. “How is my performance?” My gratitude towards Collin, who beats the odd gradually growing. What more, my parents like the fact that Lee Jonghyun, by using the name Collin, is getting more famous. My mother hid me all these while because it was difficult to describe her son, CNBLUE‘s Lee Jonghyun. Haha. However, now it’s easier to explain by using ‘Collin‘ and she’s happy about it. I will put more effort in the future to make them proud to have me as their son. I feel sad towards the end of the drama. The Olympics Games broadcast had caused the drama to be postponed for a week and a thought came up that I wished the postponement would continue. It seems that both acting and music are the same and completely different too. There are many different ways to express my feelings. Acting experiences has helped fill the emptiness in my music. To be able to convey feelings to someone, it was very difficult but at the same time, it was a very interesting experience. This way, I got to know ‘the taste of acting’ by becoming Collin and I began to have acting goals instead of just singing. Who is Collin to me? A new friend. He’s another part of me. For a while, we played and had fun together, I will always miss that friend. Eum.. in the future, when I look back on this experience, there might be things that I will regret but I will never forget Collin, my friend. 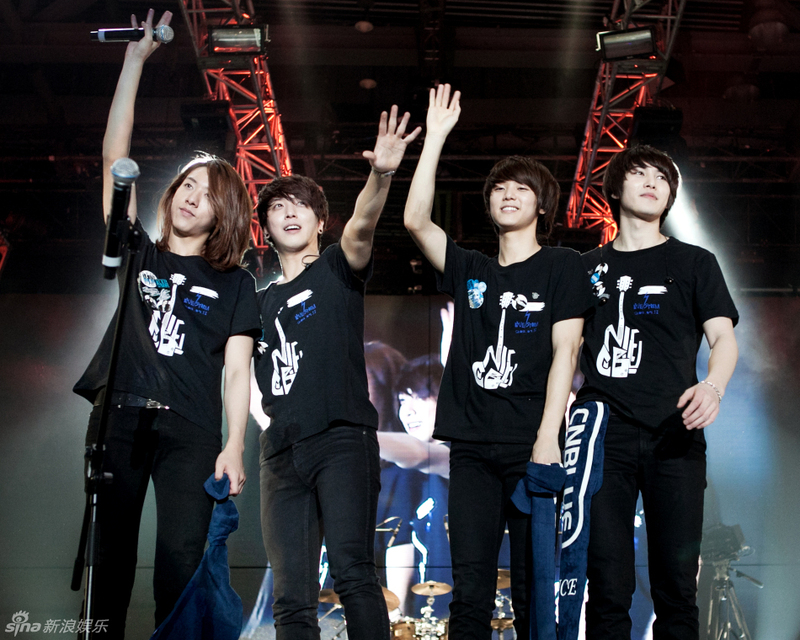 CHEER TO CNBLUE’S ETERNAL FRIENDSHIP!! Quartet boy band CNBLUE. There’s Jung Yonghwa, the leader and the main vocalist, bassist Lee Jungshin, drummer Kang Minhyuk and there’s me, the guitarist. We debuted in 2010 and this is our third year together. As the time passes by, the members get to know each other well and we support each other like brothers. Me as Collin, and Minhyuk as “My Husband Got A Family” Segwang, who were the busiest. Yonghwa Hyung was given time to rest. In the past, we were the ones who waited for Yonghwa Hyung to come home but now it’s the opposite. Yonghwa Hyung would be sending message “I’m alone..it’s lonely”, mixed with complains and funny jokes, and he’s the person that is proud the seeing us doing well. Yonghwa is the brother who is always ,full of spirit. Even though the work he’s doing is hard, he rarely expressed what he feels towards us, his younger brothers. I feel reassured at the thought of having such a strong older brother. The person that played the biggest role in letting people know who CNBLUE is of course Yonghwa Hyung. He made CNBLUE known not only just by singing on the stages but also by acting in dramas and appearing in variety shows. He’s always tired when he comes back to the dorm but he never failed to put on a smiling face to the younger brothers. I always feel sorry when I see his smile but at the same time I am always thankful to him. My personality is blunt and therefore I don’t express my feelings well, but in my heart he’s always there. Yonghwa Hyung, thank you. Jungshin and Minhyuk, my two younger brothers are the same too. You are a treasure to me and what we have cannot be changed. Minhyuk and Jungshin, being the youngest in the team, it must have been difficult. Sometimes it must have been hard for you two guys because there are times when the older brothers would be complaining, but the two of you are very matured and for that, I thank you. The drama made us spend less time talking to each other, especially Minhyuk. He had a very busy schedule and spent all his time filming his drama. But because of that, our relationship grew stronger. Then one day Minhyuk said to me that he wanted us to be like the 4 gentlemen from “A Gentleman’s Dignity“. It seemingly he was just saying it, but actually he was serious. I’ve also thought about it, so I was moved. Not only the two of us but the other members felt the same way after watching “A Gentleman’s Dignity“. “Let’s live like those four gentlemen,” we said. It would be great if the four of us in CNBLUE could grow up to be great men, just like the four gentlemen with our long and close relationship that we can flaunt of as we live together. We lived together before the debut, especially in Japan where there was no one else but ourselves to turn to, we get deeply attached to each other. That’s why the members think that I won’t have any problem acting as Collin in the drama. Since I was also busy filming during the week, so we only meet about 2 or 3 days a week. Before, when I always see them every day, I don’t really feel the importance of having them by my side. So, every weekend we would all get together and had our bonding time. Usually, we would joke around and since we don’t meet each other for a long time, I’m glad that instead, we stayed in one room and played together. Even though I don’t show it, but deep down inside “I’m really happy”, that’s what I feel. After Minhyuk‘s drama and my drama finished airing, the four of us really wanted to spend time together but the baton of acting was then passed to Jungshin. He had been practicing a lot and seems to be tensed a lot like I did before, but I hope he will do well. Lee Jungshin hwaiting! And the same goes to the other members of CNBLUE. In the future, just like what we are right now, we’ll build up good memories and we’ll look forward to the day when we will not only be known in Korea but also as the world’s leading band. I quit being involved in sports during my high school years, from then on I started doing music. Being alone as a kid, there was a lot of time for me to think. My parents were both working, so during those time I thought of several ideas and later set up a plan. The momentum was from there. I made a concrete plan in order to persuade my parents. The educational approach in our house was “take care of yourself”, so I had to be very cautious since I would be responsible for all the things I did. In fact, the first time I said I wanted to do music, my parents didn’t like it. So, in the mean time, my mom and dad left me and asked to thinking of what I look forward for if I continue in wishing to become a singer and planned about my decision. In short, it’s like a briefing for my future. Silently, my parents started to trust me. From then on I had to try my best for the sake of the faith and trust my parents have given to me. Music. I had to really practice it, since I started later than the others. I tried my best when I’m at the academy. These days, it’s still the same. If someone complimented me by saying “you’re really good”, I will just shake my head. “I still have a long way to go”, that’s what I think. When I started acting, I felt like music still fills the void that acting cannot, that’s why music is something that I can’t neglect. Acting is something that I need to finish once I started but music is my lifetime companion. In my mind I wanted to do my best while filming for “A Gentleman’s Dignity”, so in order to do that I had to practice a lot and I cut my sleeping time. Naturally, I also had to cut down the time for my guitar and singing practice. That was quite stressful for me. This was something that I have always insist on doing, it’s one of my daily routines, which was practicing together with the members. I would be practicing together with the members until 12 in the midnight, and the next day I had to shoot early in the morning. My body was a bit tired, but my mind was a bit relaxed and it still seems more alive. While I attained the energy for the next day, music was my driving force. I really think that I need to do music steadily. Since I had to practice 4-5 hours a day, my mind is focused on music, so I will continue to do it in the future. My craving for music deepens from the aspirations that we got through our street performances in Japan. Our street performances in Japan had pushed our dream that we had before our debut. Physically and mentally we were very dense, but we did our best towards “the dream”. Those days, if it weren’t for the passion of music; we wouldn’t have this kind of great friendship between us. I play guitar and would only do the chorus part from behind Yonghwa Hyung’s vocal. But all of the sudden I had to stand in place of the main vocalist on behalf of Yonghwa Hyung. Hyung was sent back to Korea at that time to shoot for a drama, leaving only Minhyuk, Jungshin and me. The three of us had to schedule all the performances in Japan and had to continue everything. The position was completely longer and for the first time I was feeling puzzled and even scared. The members and I couldn’t believe that we managed to get through that. Because of that opportunity, I was able to grow more in terms of music. Particularly for my vocal, and I made my own songs that makes me looked desirous. It’s really valuable to be able to tell things in making good songs. When someone is comforted through my songs, I’m touched. That was what made me really happy and this feeling is impossible to be replaced. At first when we started our street performances, no one was looking forward for it. It’s an empty street. But we tried to gather fans, little by little until a few thousand seats filled in a large scale venue. Without them there would be no CNBLUE, and I won’t even be here as Lee Jonghyun. I think that CNBLUE can still be here till today because of our fans who love our music. Starting from Asia Tour, we went to Los Angeles in the US and now we have performed in as far as in the UK. The day has finally come, as it has always been our wish to play instruments and have our voices heard at the Home of Rock. From the start we have always been grateful and I will do my best over the time to become a band that will be loved for many people. CNBLUE Lee Jonghyun will always try to give the best. Hwaiting!! The original post by @cnbstorm, the first part was posted by burning voice while the other two parts by fizzy all @cnbstorm. And definately all the credits goes to them. I re-posted here just because I want to read this story without jumping to the another pages. Since I never see or read the korean version ( even if I have, I’m afraid that I understand nothing! ), so I try to stick with CNBLUESTORM’s version. Small edited I was done for my style of reading only. Not forgetting to Fizzy that let me compile this wonderful and touching articles. To anyone who see I put improper credit just reach me @tara_lee26 and let me know. I will fix it immediately. First of all I’d like to thanks to my staff, Caroline who taking care and in charge at my place while I am enjoying the whole concert and Nadia who re-arranged my scheduled pretty perfectly! And to you, David, Eric, Naomi, Angela and Patrick who make this possible and willing to came along with me even though you are not boice. This is my third I wrote about CNBLUE after Lee Jonghyun, Teardrops In The Rain and CODE NAME BLUE TESTIMONIAL. Friday, Saturday and Sunday this weekend perhaps made a record as my tightest day ever! Actually, I was set not to leave London before concert, unfortunately something had happened and I have to back to leave to solve it. So it was Saturday morning when I had to pick up my aunty at Heathrow airport which then I know it was exactly the same EA with CNBLUE. At that time the airport was like normal. Half of me feel a bit pity because I thought UK boices did not show up to welcoming the boys. And another part of me feel glad, it was good none waiting, then I can see them clearly! But that thought would not stay longer. As the flight had landed, the situation change all in sudden. I don’t even know where those people come from but CNBLUE had sent Heathrow into riot! I was not dare to come to close to the crowd as I have to set my eyes on my aunty’s arrival. I didn’t even see CNBLUE passed the gate because ocean of boices come through together. From distance I saw people hooded surrounded by airport security, later I know it was Jonghyun, and also someone like thrown aback to the crowd and that was Yonghwa. I do not know where Minhyuk was it can be I did not realize it was him or I indeed did not see him. People shouted, yelled, sobbed and else. I never expected any of those and I just realize that CNBLUE is indeed well-known! Maybe I was underestimates about their popularity but with UK approach, I hope can be their gate to the another Europa countries. Several hours later when I came back to the airport to catch my flight back, it was hard to believe if in the morning there chaos here. During the day when many boices shared their pictures of CNBLUE whom they met at street, I just ocean away, struggled and pushed myself to make sure that all the stuff had done by morning. With sleepy eyes and just wanted to sleep in my head I head up again to London! Oh my God, what I was running into? CNBLUE better has something great tonight so my rushing time not such a waste!! With half soul in me I arrived in the Heathrow once again on Sunday morning, still, want to continue to sleep in my mind. I walked side by side with my assistant while I realize I was walking behind a group of people. I was hesitated if he was Lee Jungshin, although almost sure. However, I never saw him from back, so I was hoping that he will turn his back to make sure, and my prayer was answered! He took glance once or twice, and my heart just like stop beating! How could possible I saw him here? Unfortunately I can not take some photos for some reasons. All day along I just can’t put my head straight on my work, in my head just CNBLUE and CNBLUE. To make even worse when I occasionally checked my twitter account, they were everywhere! While other boices out there busying their selves to share what they see or listen, I was struggle in hotel room with laptop and my assistant trying to finish my work as soon as possible. Finally all done and I am at venue but when we were 6 arrived gate already open and boices queued not short enough to wait. Thanks, in the end we could get through in safely. The venue just like crazy even before the show had started. At first actually I have some silly thought, that this show will be like the old one, back when their live houses at Japan. To say honest, I was a bit confuse placing in the such crowd, I attended many big concert before this but those I already know them as big star, I never know how they were in beginning opposite with CNBLUE. I used to see them with less tenth , over tenth or over hundreds but over than 3000 boices just AMAZING yet they ever had bigger in Japan. Countdown getting nearer and boices also getting crazy! and as usual like in Japan the boys appeared out with rough clothes, western style! Minhyuk’s drum beats and Jungshin’s low heavy bass lead the heat of the o2 arena. the venue turns into chaos, glow sticks, flags, cameras all in the air. Intuition and Have a Good Night deliver craziness at first beginning, then even more when Wake Up , boices really wake up! Actually in the beginning I was lost because too busy keep focus on Yonghwa and Jonghyun’s guitar, it was after Have Good Night i start to decided not to and enjoying the show. Love Revolution was sent me into another world, especially when Jungshin did rap, followed by Love Girl, Yonghwa lead Jungshin to dance in intro, then turn with Jonghyun, hilarious!! they really know how to make a laugh. In Gureyo, three members turn their back and did play with Minhyuk. During talking session, they introduced themselves with short English but in the end Yonghwa said anyonghaseyo and other word that I didn’t catch. The leader really hilarious! Yonghwa even said that the night was the international night, then he pushed the speech to Minhyuk and he hope boices enjoy the show. Ballad session opening by Y,Why korean version and we all know how Yonghwa sung, very emotional and tender especially in rap part. Yonghwa was amazing!!! after Yonghwa the turn went into Jonghyun who sung Love Rides In The Rain, but still Yonghwa’s voices gave something special in the song. It was time for stabirabira rastabira, Still in Love. They took another time to chill down the show by chatting a bit. And unexpectedly they did cover Oasis’s Supersonic but Yonghwa made sudden stop and ended up with laughing, he said that he didn’t know the whole song!! My friends giggling a lot when Yonghwa mention Oasis because his pronouncement. They also said that they want to be an international band and for that CNBLUE need help from boices. In this time Jungshin also mentioned HARRY POTTER (lol). Next song was Just Please (again) korean version, I don’t know why they didn’t sing the original version. One Time English version, Yonghwa and Jungshin collaboration was a great one! Tattoo followed by Hey You, which Yonghwa said to Minhyuk, “Minhyuk, let’s go.” Let’s Go crazy lead another craziness in the o2 arena. Now or Never came after, and their performances didn’t decrease in any way, Yonghwa still wild, Jonghyun played his guitar with amazing way, Jungshin also attractive and Minhyuk drum beat didn’t slow down. I was screaming out loud as Yonghwa did too when he sung Where You Are, Jonghyun solo guitar was really really wonderful!! Yonghwa shouted ‘this song is the last song!’ then he screamed, actually he screamed in almost every song and sometimes I was worry that he might lose his voice (Lol)! In My Head, korean version! Japanese really rare, so sad. They disappear after In My Head but then rush up again as boice didn’t let them go on theat easy. Encore starting by their first and phenomenal, I’m a Loner, once Yonghwa sung the first verse, boices just followed him and sing along! Great, I can’t even make up my mouth to do that and of course, make some noise!!! And followed by their lovely but not leastly, Love. This show also shown how much their craziness, they making many laugh, though. ‘Do you know Heartstring?’ and Jungshin sung the first verse along with boices. Yonghwa also did some jogging dance while Jungshin sung. In the end Yonghwa asked Jungshin when his birthday is then all the audiences singing Happy Birthday song and Jungshin did one phrase with “I’m so happy”. Very last song was always Gomawoyo, and I can’t believe that two hours already passed, and CNBLUE really had to step down from the stage!!!! Actually I was longing for Get Away and No More, sadly those weren’t enlist, in fact in this concert they more to Korean songs rather than Japanese. It seems that I can’t miss Arena Tour this October. In the night, Yonghwa seemed to be happiest guy, his smile was widest than the other members and he was the one who keep talking, yet he ever said that English is difficult. They were making great effort to have communication with audiences and we can understand well their situation, I think it’s all because they have mix feeling at the same time, too exciting the heat of the audiences enough to swept away any English vocabulary in their mind. Overall this concert was great indeed, though we had some distraction by over hysterically boices, but it’s okay, everyone has hysteria. Actually i confuse myself about what I have to write because it’s too many I need to fix into one right story. Here I also compile my guys friend who accompanied me along the show and the one whose protest the most whenever I playing CNBLUE’s song before. but now I dare say that they’ are three already boices! They’re cool, if only they got chance to debuted in State (USA) or here (UK) with their shooting star and attractiveness performances like this, isn’t possible if they landed in billboard. Their live show were rock and his vocal indeed powerful. beside the language music really did crossed the border and I think it’s worth if we spare time for Autumn Tours in between our Asian Tours. If only I didn’t know from the start if they came from Korea, then I think they just come from this land (western). Cool, unfortunately they hasn’t got chance to debuted in Europa. They just as cool as Foo Fighters or Sound Green. But I never found in one band has two differ vocal character but they can make one unity, cool and unique. When Minhyuk’s face zoomed out in screen he shouting out, ‘How old is he? he looked like Peter.’ I said 21, ‘No kidding he’s real baby!’ (Peter is Patrick younger brother, he is 14 and drummer too.) . In Patrick lists, the eldest was Yonghwa, followed by Jungshin, and Jonghyun, the youngest should be Minhyuk. Well that’s all from me, sorry for my bad korean, see you at Arena Tours. It is seems late but I still want to do this. Also, it is my first time to review CNBLUE album in fact Code Name Blue is CNBLUE first major debut album. Firstly, I need to tell that, even now, it is hard for me to believe if CNBLUE is Korean instead of Japanese whom I used to know for the first via their live street performance on summer 2009 and back when they released their first EP indie album Now or Never. And now they about to rocking once again with the most self-contained materials sounds for BOICEs all around the world. Giving the most work to the emotional leader and burning guitarist respectively, Code Name Blue is ready to take over musical mainstream in this nearly late summer. Contained 13 songs and 14 for first edition, combine by 8 previous big hit released single songs, 6 brand new song and 1 special version with total 11 self composed made by Yonghwa and Jonghyun. Overall, this album offers fresh feeling whenever I listen to it, and despite that their previous songs who dominates the whole sound, the new one can say have more colours and softer than their usual song before. However, for the first listener Code Name Blue just gives something new and I am sure everyone will fallen their heart into it immediately. And here I am now, I would like to lead you to travel one by one into Code Name Blue, brought to you by this cool and wonderful band named CNBLUE. To those who attended CNBLUE winter tours must be familiar with this sound because in that even this musical intro been heard during CNBLUE introduction. Composed and arranged by the leader who known with his interest in various instrument, this instrumental intro full of electrical synthesized and strong drum beat of Minhyuk. And this only the gate to step up to the CNBLUE’s world, are you ready?!? In my head is tittle track for CNBLUE’s first Japanese major debut. This song composed by Yonghwa long before CNBLUE had major debut in Japan. Personally, even though I love their Japanese style of song the most, In My Head just surprise me by its heavy rock guitar and strong drum beat plus some electrical sound that a bit different with their indie songs. The lyric tells about passion and strong dream they determined to make it reality no matter the cost will takes. Where You Are was the tittle track for CNBLUE 2nd Japanese major debut singles and I would like to say as many too, that this song just sekuel of In My Head. Yonghwa shown progress in this song and so the rest of the members. Keep beating the sound and with strong other instruments line marriying electrical sound Yonghwa best known in love with to be mixed, Where You Are just quite impressive song for this young band to keep searching their colour! Has no particular differ with In My Head’s lyric, Yonghwa had deliver a message to the fans, that in despair, hope still waiting to be found and will give its help to find a way out, even just small, very small hope. Tittle track for Code Name Blue, Time Is Over basically just has Yonghwa’s style so much. There was no polar difference with In My Head nor Where You Are but it can say softer and poppy than the previous two. Brings groovy sound rather than fierce rock Time Is Over is kind of refresher to becomes my favourite among those newly released. The lyric itself telling how someone can grow even stronger whenever s/he takes advantage from obstacles lies next to them and become hero their own dream. This should be the most surprising song in this album. Yonghwa seems really like to challange himself with various genres to made and play. A party song sung by a rock band? That only CNBLUE! I think this song also gain a lot of comments and responses from BOICEs, as I did too when first time I listen to it. The feeling is like, is this real CNBLUE? Or, how come they could come up with this kind of song? Althoug I already familiar with the style because of TGI Friday Brand’s song thbt has similiar feeling but for the regular album who has no related with anything, Have a Good Night’s sound just surprising, still. Moreover, the lyric quite a bit funny, it wasn’t sound like Yonghwa’s style at all who mostly telling about dream, passion and strength. Have a Good Night simply talking about how you enjoy and relax yourself after doing tight everyday routine scedule. Anyway, this song wasn’t amusing at all and mature sound ( except, espresso double double shoots’s part, lol ). I suggest to listen to the music first then read the text, don’t do otherwise or you can’t stop laughing! Wake Up was one of the side tracks for CNBLUE Japanese 3rd singles major debut. Still fresh in mind despite the released just within less a month previously, first time I listen to this song, I was little disappointed. Because the song approach different direction, I was expecting one more fierce song. By the time, I realized CNBLUE still trying with various approach and Yonghwa as always success brought a new sound and delivered it well through Wake Up. In lyric, Yonghwa tried a new style too, to be more natural as everyday life speaking. Put his favourite band in it for instance, Yonghwa messages the listener to be yourself and keeping your own ways and telling not to follow anybody else shoes. Aside from everything, Wake Up just fun to rock out, with vocal lyric, up beat rhythms and Yonghwa’s powerful voice make Wake Up as pretty good combination. According to Yonghwa that recently he listen to the Boney M (who I listen to it recently too and it really recalling back my childhood memories back then my Dad often plying it.) No More has a bit taste of disco 70’s n 80’s that surely they want listeners to dance together. Once again CNBLUE surprise everyone with beyond the expectation track. Yet, maybe fans longing to this song and pay more attention because this was the first time ever Yonghwa and Jonghyun composed a song together. Even though they didn’t intend it at first. No More also one from the few of CNBLUE’s song who talk about girl. However, I pay less attention on its lyric and focus on music only. And I dare say if No More is my next Get Away who I prefer to instrumental rather than a full song with lyric. This was the first song from the album that Yonghwa didn’t involved in any, lyric on music. Composed by Jonghyun on his 2nd grade senior high school, almost the same time when Yonghwa made Y,Why. These Days just help the listener to cooling down their feeling after 9 tracks nonstop up beats tempo song! Unexpectedly, rather than focusing on guitar sound whether Yonghwa or Jonghyun’s like usual. My attention just went to Jungshin’s bass sound. Our maknee did really great job in this song. First time I realize too, his skill had grown a lot. Actually, I was a bit expecting that Jonghyun will sung alone but hearing Yonghwa’s sweet falsetto on the bridge just make These Days even more wonderful. Yonghwa’s voice deliver another feeling on this song. Something like romantic yet saddened. Basically, I pay less attention on ballad song but These Days throws me into another world as I’m start learning bass right now! Light, inspirational and emotional song and very first song on the list so far that no CNBLUE’s members hand on it. This also my very first time I like ballad song straight away. Basically, I like the song who has acoustic guitar sound in it and this song sung by Yonghwa that known with his powerful and emotionally voice, solely in english so I don’t need to read the text to understand the content and that is plus! As I rarely pay attention to their lyric ( moreover when it comes to Japanese or Korean, I didn’t speak into ), whenever I listen to Blue Sky, its music and Yonghwa’s voice seem send me into the place where I can play my guitar under the blue sky surrounded by greenery and accompanied by breezy wind who blowing gently. Simply sitting alone and enjoying the nature on my own. The beats heat up again by Mr. K.I.A. For now it will going to the song Yonghwa refer as warning to him and behalf of CNBLUE members to be humble even though nowadays, they are just a superstar with a lot of fanciest stuff to be received already. Second song whom CNBLUE has no hand it. For this song my intention just went into Yonghwa and Jonghyun’s guitars who marry with Minhyuk’s drumbeat and Jungshin’s low sound of bass line! I would love if this With Me went as instrumental rather than full song with lyric. First I listen to it, it just one of CNBLUE’s style of song and this also one of b-side of CNBLUE’s 2nd Japanese major debut singles Where You Are. but then again I just screaming out when I saw the credit to who was composed the song, Lee Jonghyun! my first impression toward him so far is ballad master and it should change from now on. i never ever imagine that Jonghyun will composed such a fierce song. Get away also the song that I prefer to be instrumental only rather than full song with lyric. Conclusion for the Code Name Blue and time to push the reply button immediately. Come On was tittle track for CNBLUE’s 3rd Japanese major single album that released just previous weeks before Code Name Blue. To this Come On I have feeling and I dare say, if, Yonghwa has Where You are as evolution for In My head, then Jonghyun has Come On to Get Away. According to Jonghyun that he composed Come On by imagining Yonghwa’s the way singing made Come On jus so impressive! one of my favourite song and stays in my playlist once I got the copy. However, Come On actually different with CNBLUE’s previous up beat songs, it more close to hard rock and became the most intense song in this album. Overall, Code Name Blue just exactly what Yonghwa mentioned for several time, like plying your I-pod contained various genre and artisans, but in this case, CNBLUE is the only artisans. The guitarist duo have proved themselves that they had grown and as good as senior composers who ever helped them before. Meanwhile, the duo rythms instrumentalist also shown that they are , even though didn’t take part as composer or lyricist, their job not as easy as it looks. they two had shown how much their part token in this wonderful and freshly album. Lastly, I would like to tell that no regret at all for you the beginners to try to listen to this cool band. and so, this post made for my tribute to CNBLUE’s bassist, LEE JUNGSHIN who celebrated his 21st birthday today, for his hard work to help this band achieved so many in short time and light up the rest of the member as Happy Virus. Please take a note too that I am not expert, this only based my self-satisfaction and all dedicated to them who make my day full of energy everyday. A successful business woman, owner of hotels and restaurants. Stubborn, strict, optimistic and realistic woman. One sided love to Monkey and good friend to Giraffe. A music director, ambitous, workaholic yet easy going person. Has complicated relationship with Turtle and pretend that he does not know if Mary fancy him. A singer-songwriter, producer, rather stubborn, does not like challange himself but eventually he realize that is not always bad. Then he even leave his love in order reaching his dream. He has complicated relationship with Monkey. A musical professor, quite but playful person, one sided love to Mary. A photographer, best friend who more like a younger brother to Mary. Michivieous and likes a laugh guy. wanna know what I am thinking? This! don't wanna missed my lattest post?